The Summer Institute in International Humanitarian Law and Human Rights (Summer Institute 2017) will be held this year on 25-27 September in Bali, Indonesia. The main conference focusing on the theme of “Trade, Investment, and the Rule of Law in ASEAN” will be held over the course of two days at Conrad Bali Hotel. This will be attended by economic officials from ASEAN Member States, relevant ASEAN sectoral bodies (ASEAN Intergovernmental Commission on Human Rights (AICHR), ASEAN Commission on the Promotion and Protection of the Rights of Women and Children (ACWC), ASEAN Committee on the Implementation of the ASEAN Declaration on the Protection and Promotion of the Rights of Migrant Workers (ACMW)), ASEAN Secretariat officials, business leaders, and experts from the academia and civil society. The overarching objective of Summer Institute 2017 is to provide a platform for these stakeholders to meet and exchange views on going forward in realising the ASEAN Economic Community and the ASEAN Community Vision 2025. Together, they will discuss the vital link between trade, investment, and the rule of law, share models for good business practices, and explore possible mechanisms for the different sectors to pull together to advance good governance and the rule of law, thereby facilitating advancement of human rights as embodied in ASEAN agreements and in the relevant legislation and policy of ASEAN Member States, while trade and investment in the region continue to flourish. The main conference will be followed by a Studium Generale or public forum for university students at Udayana University on the theme “The Rule of Law for Inclusive Growth in ASEAN” on 27 September 2017. 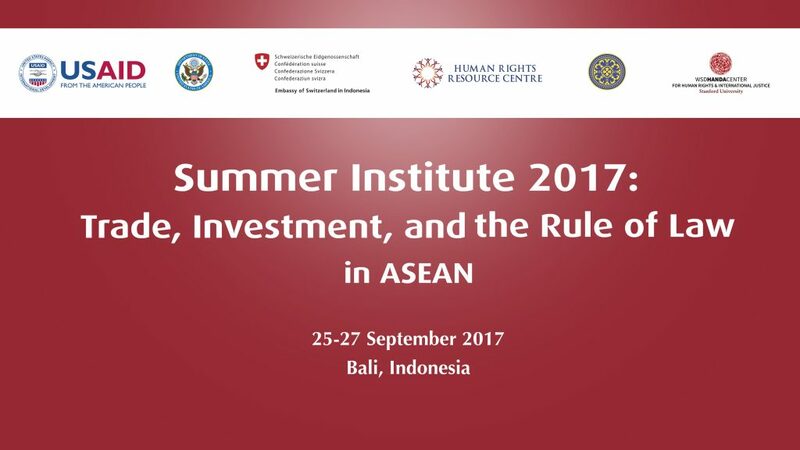 The Summer Institute is organised by the Human Rights Resource Centre, WSD HANDA Center for Human Rights and International Justice at Stanford University, and Udayana University. The event is supported by the USAID ASEAN Connectivity through Trade and Investment, ASEAN-U.S. PROGRESS, the Embassy of Switzerland in Indonesia, and the Ministry of Foreign Affairs of Singapore. AICHR, ASEAN, Business & Human Rights, Events, Rule of Law AEC, ASEAN Community Vision 2025, ASEAN Economic Community, Investment, Trade. permalink.